There is nothing like the sound of siblings singing together. Whether it's the Beach Boys or the Everly Brothers-or, more recently, First Aid Kit-absorbing the same breathing rhythms and speech patterns adds an element to vocal harmonies that can be pure magic. 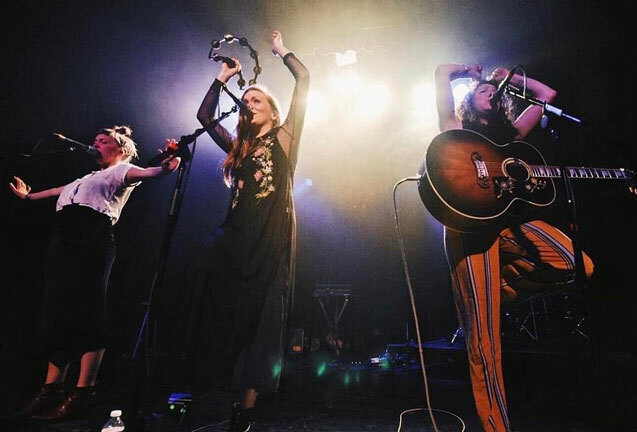 With the release of I'm Alone, No You're Not, the mesmerizing, hypnotic sound of the trio known as Joseph-made up of sisters Allison, Meegan, and Natalie Closner-joins this elite company. "It's just second nature, like a fifth limb that's already on you," says first-born Natalie. "There's an ability to anticipate what's going to happen and blend with it. When Meegan and Allison sing, they know exactly what I'm going to do and when." But the Closners didn't actually start singing together when they were growing up in Oregon, the children of artistic parents (their dad was a jazz singer and drummer, their mom a theater teacher). Natalie was the performer-"the older sister who stood on the edge of the fireplace and told everyone, ‘Watch me!,'" she says. Twins Meegan and Allison stayed out of her lane, joining in for their mother's musical theater productions but otherwise avoiding the spotlight. "It was kind of dramatic," she says, "He took me aside and said, ‘I don't think you really believe in this.' It stopped me in my tracks." She thought deeply about the music she was making and had a curious epiphany; she decided to ask her sisters if they would consider singing with her. Initially, they didn't really get it. "We thought she was asking us to be background singers, so we didn't take it that seriously," says Allison. "It was more commitment than I was expecting-I even tried to leave at one point, but after a while, I was convinced." A transformation occurred when the Closners were in the process of recording their first album, Native Dreamer Kin. At the time, they were calling themselves Dearborn, but their producer felt that the name didn't fit the strength of the music. They went to visit their grandfather Jo, in the eastern Oregon town of Joseph. Allison made a playlist for the trip and called it "Joseph," which is what influenced the band's name. "Once she said it, it just hit us all-that's what this is and who we are, these are the sounds of the land that we've lived on," says Natalie. With this new sense of themselves, Meegan and Allison began taking a more active role in the group's songwriting. Meegan notes that while the process was a "totally new journey" for her, it felt similar to the candor and vulnerability of her long-time journaling-just "pulling out the gold and arranging that into neater lines." She and Natalie both point to the song "Honest" as a keystone for the development of I'm Alone, No You're Not. "We were trying really hard to write a song, but nothing was coming," recalls Natalie. "One night, Meegan was working on some lyrics and getting frustrated, so she wrote in the margin of the page, ‘I can't say a true thing. It's hard to be that honest.' Immediately after that, her most honest sentence spilled out-‘There's always two thoughts, one after the other: I'm alone. No, you're not.' And she thought, ‘Oh, there's the song.' "
As they moved toward making their second record, the project took an additional turn when the Closners decided to work with some other songwriters in Los Angeles. "We were afraid of it at first because the songs were more pop than we were used to writing," says Meegan, "but as we internalized them, they started becoming super-important to us." They point to "More Alive Than Dead," co-written with Ethan Gruska, as an example of these contributions. "That song describes an experience with a partner where you have hard things in your combined past," says Natalie. "You're haunted by them until you realize that those things are dead, and as long as you dwell on them, you're missing the real live person in front of you." She adds, though, that Gruska was critical in clarifying and sharpening the nuanced emotion of the lyric. "When Ethan sent us back the demo, I lost it, He was able to see the heart of the song and bring it out, cut to the core of what I was trying to say." "This was our first time doing a recording like this," says Natalie, "and we learned so much about creativity. Mike is a genius, and he's just a total maniac as a musician, so he took these bare bones songs and brought them to life with lush, gorgeous textures and sounds." The initial reaction to the music on I'm Alone, No You're Not has been remarkable. Joseph was selected as a #SpotifySpotlight artist, and booked for festivals including Bonnaroo, Pickathon, and Sasquatch even prior to the release of the single "White Flag," a song inspired by an article predicting a massive earthquake for the Pacific Northwest. "Reading that created a heaviness that was making us jumpy, scared, and miserable," says Natalie. "It became clear we had two options: be scared and cowering, backing away from the world into paralysis, or keep moving and live. Defy fear. Wear peace. Find better ways to love the people in our lives instead of huddling together like frightened sheep thinking about earthquakes." "It really is about connection with people, and we're so grateful we've gotten the chance to do that. This has been a totally wild journey, and we're constantly blown away with possibility of what could be."